Small Vanity Unit with rounded door and integrated handle. Colour: Swedish Princess Cake. Cabinet in black ash wood, black leather handle and black basin tap! Soft closing door and two adjustable shelves. Soft closing door. Super thin ceramic wash basin. Soft closing door. Super thin ceramic washbasin. PUM Outlet Angle is included. Very thin ceramic sink with no overflow. Special basin waste in chrome is included. Colour: Solitude. Thin flat mirror, with edge banding in mirror design and an energy-efficient LED lamp with a long lifetime and a daylight colour temperature. 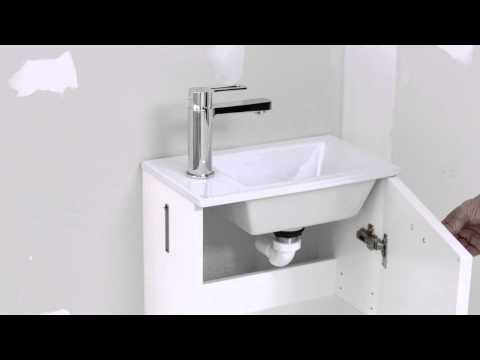 For the smallest bathrooms, we have developed a smart compact vanity unit. Smaller versions of our other series: Swoon Single Side, lipped door with a thin straight silhouette. Swoon Single Soft, gently rounded door with an integrated grip. Swoon Single Square, our own modern version of a classic framed door. Swoon Single Vanity Unit is a stylish and smart little piece of furniture (or cabinet) for the guest toilet or powder room, only 250 mm deep. Because the height is 700 mm the cabinet accommodates surprisingly much! All the sink cabinets in the series Swoon Single has a soft closing door, two adjustable shelves, and two clever towel holders, which are mounted on both sides of the cabinet frame. The thin ceramic washbasin has no overflow. For more information about Swoon Single Side Vanity Unit, Swoon Single Soft Vanity Unit, Swoon Single Square Vanity Unit, Swoon Mirror and our other PRODUCTS. 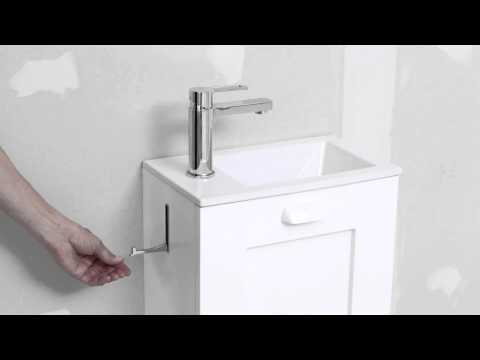 "A compact furniture for small guest bathrooms and powder rooms. Because of the possibility to change doors, colours and handles you can match this design with the rest of your home!"